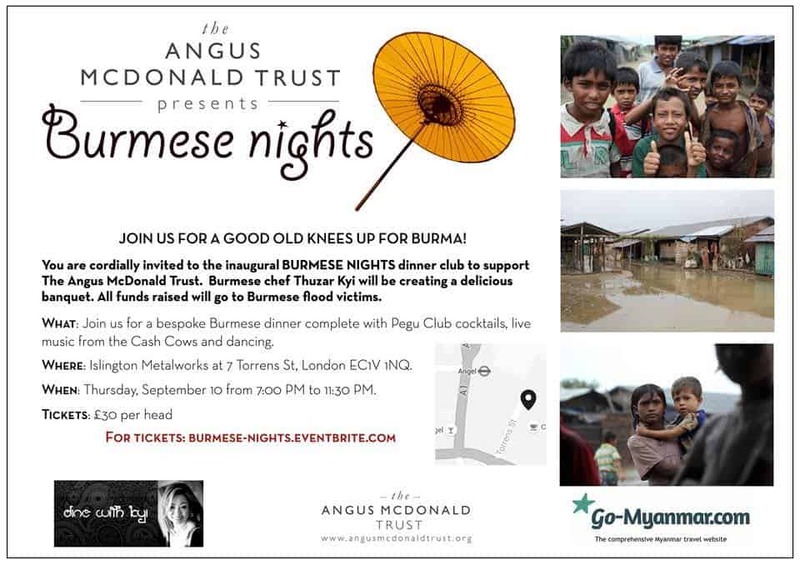 The Late Chef was invited to the event being run by the Angus McDonald Trust to raise funds for victims of the Burma floods. Unfortunately, I cannot join in the evening but I know it will be a great time, especially with the menu being prepared and cooked by British-born Burmese chef Thuzar Kyi, the event promises to be fabulous and fun! BURMESE NIGHTS is the brainchild of trio Catherine Anderson, Sarah Ludlow and Alexandra Quinn– who originally met working together in the House of Commons for MP and fellow Burma-phile Rory Stewart – and the latest fundraising event organised by The Angus McDonald Trust, a charity set up as a lasting legacy to the man it is named after. The Trust was created in 2014 in memory of the talented Australian photojournalist who suddenly died while travelling in Burma in 2013 with his fiancée, Catherine. Event to raise funds for Burma flood victims. If you want to get tickets go to the Eventbrite page and book to enjoy a great evening raising funds to help the victims in Burma.